Prequalification submissions are due Feb. 15. 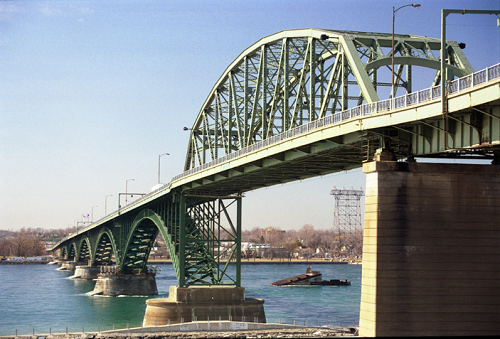 Contractors will oversee major recoating of the Peace Bridge, which spans the Niagara River internationally between Buffalo, New York, and Fort Erie, Ontario. The Peace Bridge underwent lead remediation between 1994 and 1998, and received a two-coat organic zinc-rich epoxy primer and polysiloxane top coat. Following widenings between 1994 and 1998, new structural steel members were also painted with the two-coat organic zinc and polysiloxane system. These new structural steel members will not be coated in the upcoming project. The project will include complete coating removal and replacement of the remaining areas of the structure using abrasive blast-cleaning within SSPC Class 1A containment systems. Abrasives may be expendable or recyclable, and spent abrasive and paint removal waste will be disposed in its country of origin. Existing steel members to be abrasive blast-cleaned will be performed to Near White (SSPC-SP 10) standards followed by a two-coat organic zinc-rich primer with a polysiloxane top coat. It is intended that the new coating system will not be proprietary and acceptable products will be included in the project specifications. The Peace Bridge is currently undergoing rehabilitation including replacement of the concrete deck and structural strengthening, which is expected to be completed in the summer of 2019. All prime contractors and subcontractors performing abrasive blast-cleaning and coating will require valid SSPC-QP 1 and QP 2 certifications. Canadian contractors not possessing valid certifications will be permitted as subcontractors, provided they meet the other prime contractor requirements, and work under the prime contractor’s certifications. It is presently anticipated that formal bid documents will be issued to prequalified bidders on or around March 1, with a bid opening on or around March 29. The anticipated completion of the coatings program is anticipated to be the end of 2020. Reported by Paint BidTracker, a construction reporting service devoted to identifying contracting opportunities for the coatings community. Visit us on Facebook!